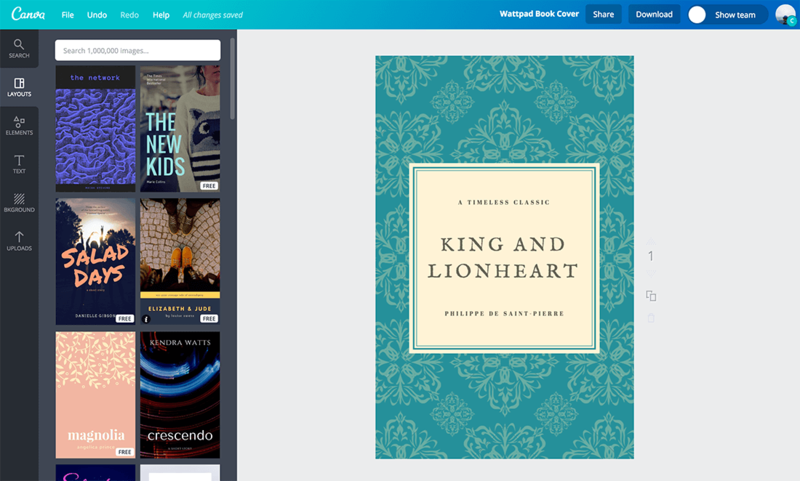 Canva’s Wattpad cover maker makes it especially easy for anyone to design their own creations—even for those with little to no design experience! The hard part’s over. You’ve brought your story to life. Now it’s time to create a matching cover that whets your readers’ imaginations. Choose from our library of high quality stock images—or use your own! With over a million stock images, graphics, and illustrations available on site at Canva, you can be sure your creative juices won’t run out. Many of them are free, while premium images are priced at $1. Using professional photography ensures your cover looks its best at an affordable price. For a more personal design, you can also upload your own images onto the site to use on your book cover! Once they are stored in your library, you can use them as many times as you like. Keep things simple, and be your own Wattpad cover designer! You published a story on your own, so it’s only reasonable that you create a fantastic cover on your own as well! Canva’s collection of pre-made Wattpad covers have been crafted by our team of designers, which means good news for you: you can end up with a professionally-made Wattpad cover at a fraction of the cost of hiring a personal designer. Why spend so much when you can just find the perfect design on Canva and customize it later? Does inspiration strike you better when you’re on the go? You can create and edit designs anywhere when you add Canva to your mobile devices. Our iOS and Android apps are free to download from the App Store or Google Play. Be your own manager, and marketing team as well by sharing your finished Wattpad cover across your social media networks. Click the Share button and post your brand new cover design directly on Facebook, Twitter and more. And if you really want to get out there, click Download to save a PDF file of your design onto your computer, and then print it out as a flyer, or a poster!